New offerings for 2012 see factory cabs on 4520C and 5220C Branson tractors. The new 20C series tractors from Branson sport all-steel cabs on the 4520C and 5220C machines along with heating and air-conditioning. The cabs provide all-weather protection for the operator, and feature redesigns that move the hydraulic control valve closer to the operator, better access to pumps, hoses and radiator screen cleaning, a shorter gear lever for easier entrance and exit and a parking brake that has been moved to the side of the seat. Other features on the 20C tractors include a suspension support spring shock system on the hood to replace the "prop stick", a new easier-to-find hood opening lever in the center front, and a redesigned hood/bonnet assembly with rounded headlights. Keeping the operator out of the weather is the design of Branson's new 20C series tractors. 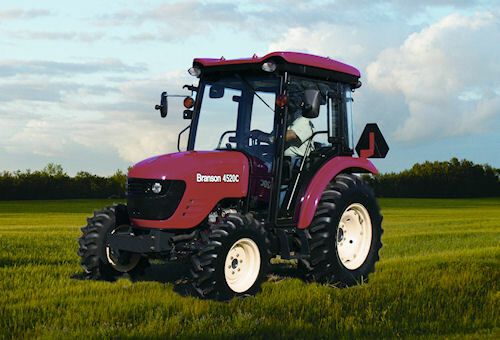 For more information on the 20C models and other Branson offerings, visit www.bransontractors.com.